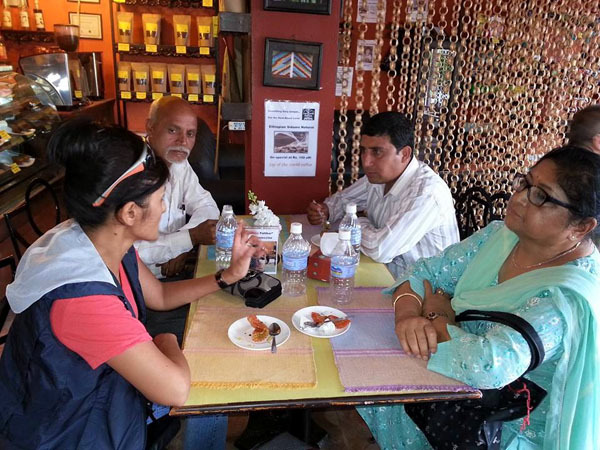 June 16th, 2015 second meeting with village school master – ArunasNepalRelief, Inc. Together we can help! A little hope goes a long way! We sit down at a café in Kathmandu and this time its Mr. Gautam ji the school master of Shree Sami Bhanjyang School in Dhading. HLF’s member Mr. Sitaram ji also attends meeting. My mom happens to be there as we have been walking all day for the past 3 days trying to resolve technical issues with phone unlock, SIM, USB Dongol, internet connection….etc. and time is very limited going from place to place then heading straight to meetings. She is my pillar of strength! Despite what she has endured she looks after my son and myself day in and day out, walks with us everywhere and makes sure we are safe because she does not want anyone to take advantage of us. She is our body guard, she knows all the whereabouts and the people very well, who means well and who doesn’t, who is there to sincerely help, because we have traveled so far to come help! We’ve learned from Mr. Gautam ji and Sitaram ji that the top priority need is for the village school that has been devastated has students who simply need backpacks, school supplies and l hygiene kits. We can add to it by ArunasNepalRelief, Inc. donated supplies, raincoats during monsoon will be a very important addition. Copyright © 2019 ·ArunasNepalRelief, INC.